Results from WWF's first European-wide family bloodtesting survey released today found a total of 73 man-made hazardous chemicals in the blood of 13 families from 12 European countries. Some chemicals were found at their highest levels in the children. Brussels, Belgium/Gland, Switzerland – Results from WWF's first European-wide family bloodtesting survey released today found a total of 73 man-made hazardous chemicals in the blood of 13 families (grandmothers, mothers and children) from 12 European countries. The highest number of chemicals was detected in the grandmothers' generation (63). However, the younger generation had more chemicals in their blood (59) than their mothers (49), and some chemicals were found at their highest levels in the children. WWF’s Generations X survey (with participants aged 12 to 92) confirms the results of previous tests on Members of the European Parliament, EU ministers, scientists, and celebrities. "It shows we are all unwittingly the subjects of an uncontrolled global experiment, and it is particularly shocking to discover that toxic chemicals in daily use are contaminating the blood of our children," said Karl Wagner, Director of WWF's DetoX Campaign. Blood samples were analyzed for 107 different man-made persistent, bio-accumulative and/or hormone disrupting chemicals from five main groups. Results reveal that every family member is contaminated with a cocktail of at least 18 different man-made chemicals, many found in everyday consumer goods. Newer chemicals in widespread use, such as brominated flame retardants, perfluorinated chemicals and artificial musks — contained in daily use items such as computers, textiles, cosmetics or electrical appliances — can be found more frequently and often at higher levels in the youngest generation. In contrast, the grandmothers generation is the most contaminated with older, banned chemicals, such as DDT and PCBs. "How much more evidence is needed before industry and European politicians accept that these hazardous chemicals cannot be adequately controlled?" added Wagner. "The draft EU chemicals law, REACH, is currently facing a frontal attack from the chemical industry and European legislators seem happy to let them pull the strings while ignoring their responsibility to protect our health." The flame retardant TBBP-A, used in printed circuit boards in electronic appliances, was found in 18 family members (3 grandmothers, 7 mothers and 8 children). The highest level was found in a child. Of the 31 different PBDEs (polybrominated diphenyl ether) flame retardants analyzed in the survey, 17 were found in the childrens' generation, compared to ten in the grandmothers' and eight in the mothers'. And the highest level of Bisphenol-A, an oestrogenic (hormone mimicking) chemical, used for the manufacture of certain plastic bottles and CDs was found in a child. WWF warns that these results are very worrying as most of the chemicals found only break down very slowly, persist in the environment and accumulate in our bodies to ever increasing levels during the life span. The study raises the question of whether future generations will be more exposed to potentially carcinogenic or endocrine disrupting chemicals that may lead to negative long term health effects. • WWF's Generations X study was done in Belgium (2 families), Denmark, Finland, France, Germany, Greece, Hungary, Italy, Latvia, Poland, Sweden and Luxembourg. • WWF looked for 107 different man-made chemicals from 5 main groups and three substances: 12 organochlorine pesticides (including DDT); 44 polychlorinated biphenyls (PCBs); 33 brominated flame retardants; 8 'non-stick' perfluorinated chemicals (PFCs), including PFOS and PFOA; 7 artificial musks (used in cosmetics and cleaning products); 2 antimicrobial (triclosan and it's breakdown product, methyl triclosan); and the polycarbonate plastic monomer Bisphenol-A (an endocrine-disrupter). • This study was done with the support of the EEN (EPHA Environment Network) and Eurocoop (European Community of Consumer Cooperatives). Daughter of a Finnish family being tested. 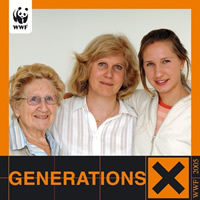 Three generations of a Belgian family tested by WWF.